With such a gadget, there are always two types of people. The one who thinks cool, maybe a gift for a child in my environment, the other who thinks awesome, I need that in my office. And with a size of 11.4 x 4in you can actually think about purchasing it for your own desk if you have little space left. Although the ramp and the pins are both described as “metal” at Banggood they are probably made of wood, but this has only a little effect on the functionality of the gadget. Only the ball, which is also most useful, is made of metal. The pins are about 3 inches high, making them prone to lose. Because there are no spare pins included, you should be a bit careful with them. Especially when you take it with you for travelling. Related to the difficulty of the game, as an adult you can not expect a big challenge. The ramp is movable, whereby it is possible to have the ball hit the pins at different angles. In addition, there is a band at the end of the wooden path, which makes it easier not to lose the ball and the pins. 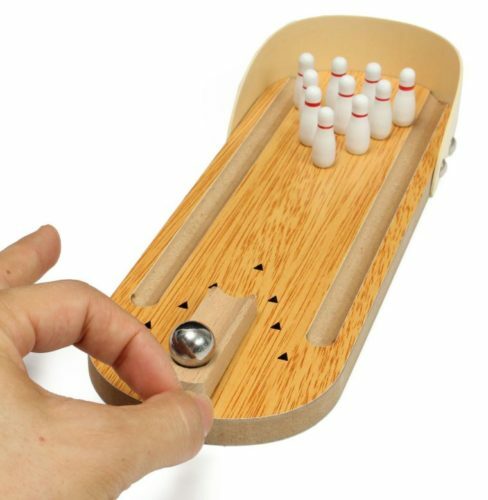 For this price a nice little gadget which is also a perfect decoration for big bowling fans.